For the April meeting of the Chicago Nerd Social Club, we discussed Agents of Dreamland (2017) by Caitlin R. Kiernan. 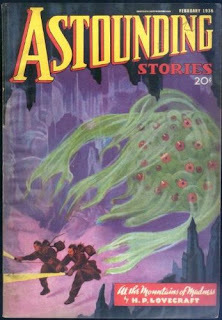 The agents in question are members of two different shadowy organizations who seem to be combating (or at least monitoring) incursions by some kind of Lovecraftian Elder-God-Type scenario; the novella alternates viewpoints between these two agents and Chloe, a young woman swept up in a sinister cult. We read this fairly hard on the heels of Kij Johnson's The Dream-Quest of Vellitt Boe, which is also a Lovecraft-engaging novella. Lots of that going around right now—mentioned LaValle's Ballad of Black Tom and Ruff's Lovecraft Country as two other recent examples, and there are many more! 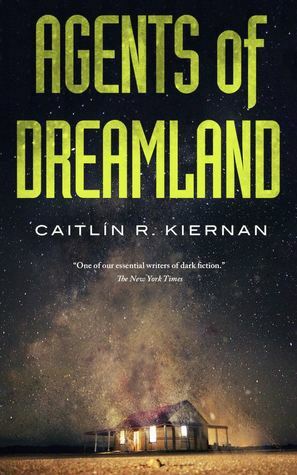 We really liked Agents of Dreamland, and thought it relies less on knowing Lovecraft than does Vellitt Boe (had a few folks say that not knowing the Lovecraft refs didn't hurt their enjoyment of the story at all). We really liked the tone of the novel, very effectively paranoid/tense/creepy. Compared both the vibe and the plot armature to shows like the X-Files or Warehoue 13, or to the later entries in Stross's Laundry Files series—earlier books like The Atrocity Archives, which we discussed last year, are quite a bit goofier than Agents of Dreamland. Big thumbs up to this qua novella: it's a length that often has members wishing the author had either finished their novel or not padded-out their short story, but we really liked how this did what it did in the length Kiernan gives it. Whereas a lot of Lovecraft lit is reacting to and interrogating his racism or sexism, this one is perhaps most noticeable for how much more we liked the writing: Lovecraft's style, while certainly distinct, is not, for most critics, what one would call "good". But this was a delight to read; I really liked how Kiernan non-ham-fistedly pulled off three different narrative voices and styles. We liked the noir-ishness of the Signalman, made comparisons to Hammett's Continental Op, although we did point out the unquestioned trope of the heavy-drinking detective/agent. Hunter S. Thompson came up in two unrelated discussions—his son Juan's memoir about Hunter's drinking and how it affected him, and also the way that Chloe's stream-of-consciousness, altered-mindstate chapters evoked something like Thompson's style—comparisons also made to Beats, like Keruoac. Incidentally, I really liked how this takes the "cult" aspect of the cult seriously, looking at brainwashing and the interpersonal dynamics. "Cordyceps is so hot right now"—noted how often zombie ant fungi are getting the spotlight these days. We actually talked about this quite a while ago at our discussion of The Girl with All The Gifts. Vastly amused that Kiernan's book-tour was called "Fungus Among Us". That led us into a larger brain-altering parasites discussion, including whether or not cats are puppet-mastering their owners (see for instance the Radiolab about toxo). We liked the subtle alt-history of this world, very believable, and had us actually looking up (for instance) whether or not Burroughs ever directed a Hollywood film. Our biggest uncertainty, plot-wise, revolved around Chloe's agency & motivation—whether it was simply jealousy that motivated her, or some more obscure & possibly Cthulhu-mythos-extrapolated interference from other supernatural beings. We also wanted to know more about Immaculata, and compared her condition to Chiang's Story of Your Life. I noted that, for those who know Albany, New York, it is a weirdly good place to base a paranoid, gloomy, doomed agency. Much far-ranging discussion of Lovecraft and his influence, including Del Toro's abandoned project to film The Mountains of Madness after Scott's Prometheus basically hit the main points, and the way that the SF/F/horror genres are still debating and reacting to his influence—the recently-changed World Fantasy Award, for instance. And we noted that S.T. Joshi, an influential Lovecraft scholar, is a big reason that there's so much ongoing toxicity in the discussion. But! Agents of Dreamland: definitely gets the CNSC thumbs-up. Also! NEWS: we are changing venue, moving just up the street to Volumes Book Cafe. We'll be there next time, May 8th, to discuss Yoon Ha Lee's Ninefox Gambit. As always, keep up with The Chicago Nerd Social Club on their website and Facebook page! Lots of Chicago Nerd-related goodness at C2E2 & surrounding events next week.